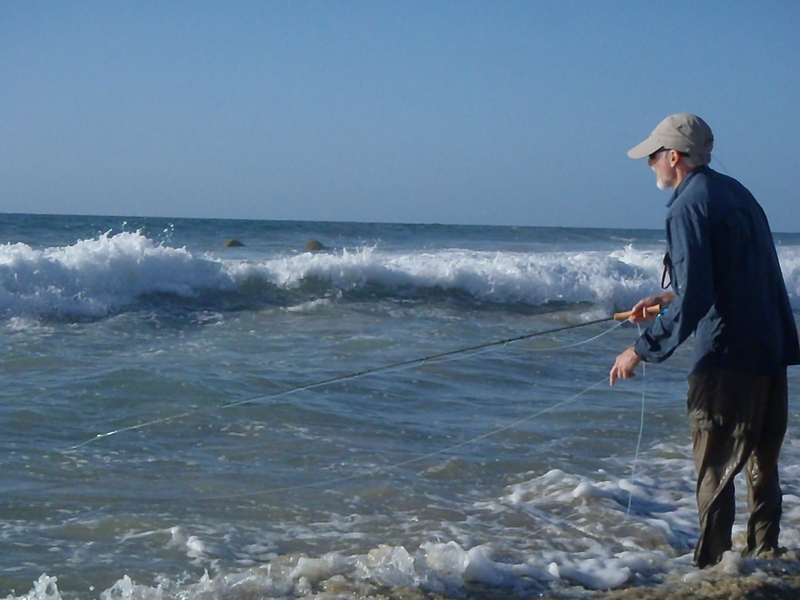 Mike Sepelak of Chapel Hill, N.C., cast in the East Cape surf for roosters and jacks. They cruise brashly through the emerald green waters along the Baja’s East Cape beaches, north to south, bristling with attitude. One minute there’s nothing in sight, and the next a pod of half-a-dozen of these resolute swimmers is whistling through the surf, and if you want to connect you need to drop everything and give chase. Drop your beer. Drop your camera. Be prepared to lose your hat as you run at a full sprint into the southern wind (and be ready to go swimming to get it back). And, when the dash is done, and you’re doubled over, hands on your knees trying not to puke, be prepared to lose your self esteem. The big roosters and jack crevailles of the Baja will steal it from you, like a gang of street toughs might separate you from your wallet and watch. And you’ll feel fortunate that that’s all you lost in the process. And you’ll do it again. And again. The author holds a big jack crevaille caught by Phillippe Valdez. Photo by Mike Sepelak. They come in waves, the dark pods of jacks ranging from a few pounds to something that gives you pause as you load your 9-weight, wondering what on earth you might do should you actually connect. They’re followed by similar packs of roosters, fearless and impudent. Both will make your heart race. Both will make you wonder what on earth made you think that landing on this stretch of beach at this particular time was an idea worth having. And then one turns on your fly. 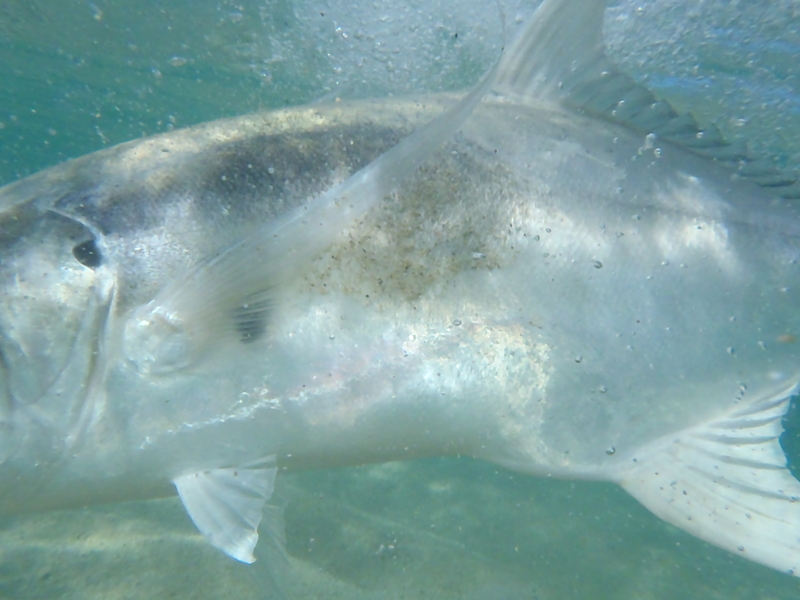 A big jack, hooked by Phillippe Valdez, the operations manager of the Hotel Buena Vista Beach Resort on Baja’s East Cape, flashes the underwater camera during the fight. The first time, your legs will turn to jelly—and not just because you’ve been running at a full sprint for the last hour. When one finally decides it wants to check out what you’ve been throwing clumsily into the surf, you can feel the dose of adrenaline as it hits your heart, and everything goes tense. As the fish closes on your fly—and let’s be clear, here: you simply cannot strip a fly through salt fast enough to outrun one of these burly thugs—you prepare for that moment when your line goes tight. Your arms are tense. Your feet are dug into the warm, wet sand. You’re ready. Then it turns. It’s decided that it’s not interested. No bueno. You lift your line and immediately cast again—false casts are for trout guys. 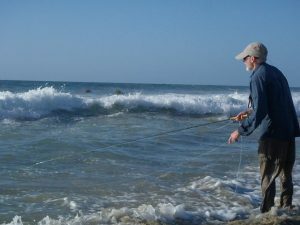 But the fish have moved another 20 yards down the beach, so you give chase, knowing deep down inside that it’s fruitless. Finally, when you can’t run any longer, and the fish are well ahead of you and on their way to Cabo, you stop. And then, just as you’re catching your breath and about to wander back up the steep incline of the beach, somebody behind you shouts. That’s when you have to decide if this is for you… if this is really the fly fishing you want to do, and if you’re desperate enough to go through the rush, and probably the failure, all over again. Turns out, I was. And I still am. I didn’t connect that first day on the beach. They took my wallet. My watch. My dignity. But I’ll do it again.